Jacob Goldsmith, The final chapter: What happened to his son Frank? As of 1930, only six of Jacob Goldsmith’s fourteen children were still living: Annie, Celia, Frank, Rebecca, Florence, and Gertrude. As seen in my prior posts, Eva died in 1928. 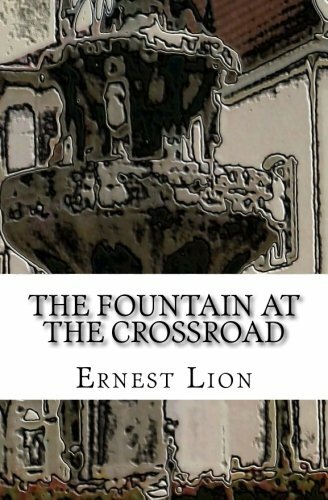 In addition, I have written about the deaths of Gertrude in 1937 and Rebecca in 1940. There remain therefore just four siblings to discuss, and by 1945, they were all deceased. Her sister Annie died four months later, on May 29, 1933, in San Francisco.2 She was 77 and was survived by her three children, Josephine, Harry, and Fanny. Sadly, Harry did not outlive his mother by much more than a year. He died at 53 on August 4, 1934, in San Francisco.3 He was survived by his wife Rose, who died in 1969, and his two sisters, Josephine and Fanny. But Josephine also was not destined for a long life. She died less than three years after her brother Harry on April 23, 1937; she was 59. Like their father Augustus who’d died when he was fifty, Josephine and Harry were not blessed with longevity. 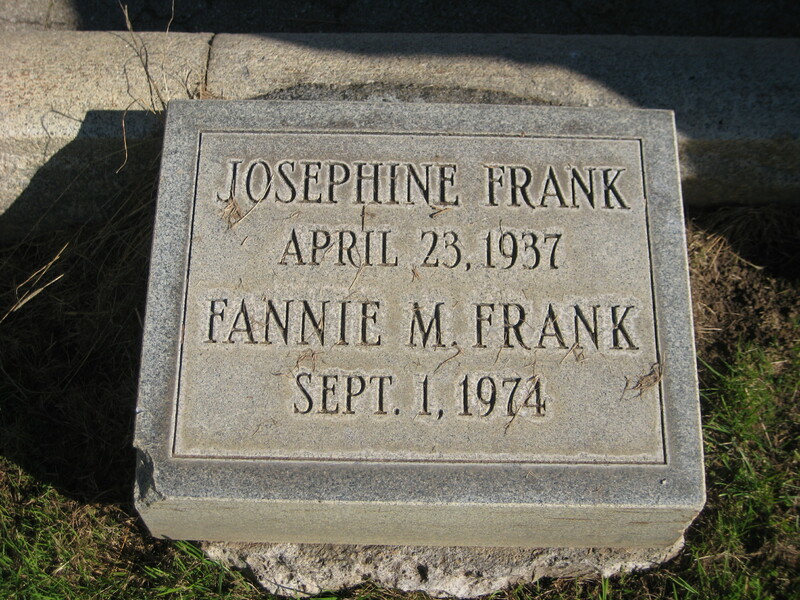 Find A Grave, database and images (https://www.findagrave.com : accessed 05 March 2019), memorial page for Fannie Mendelsohn Frank (unknown–1 Sep 1974), Find A Grave Memorial no. 100371723, citing Home of Peace Cemetery and Emanu-El Mausoleum, Colma, San Mateo County, California, USA ; Maintained by Diane Reich (contributor 40197331) . Of Augustus and Annie’s children, only Fanny lived a good long life. She was 93 when she died on September 1, 1974.4 According to her death notice in the San Francisco Chronicle, she had been a dealer in Oriental art objects.5 Like Josephine, Fanny had never married and had no children, nor did their brother Harry. Thus, there are no living descendants of Annie Goldsmith Frank. I mention this because for the longest time I was having no luck finding out when or where Frank Goldsmith died or was buried. 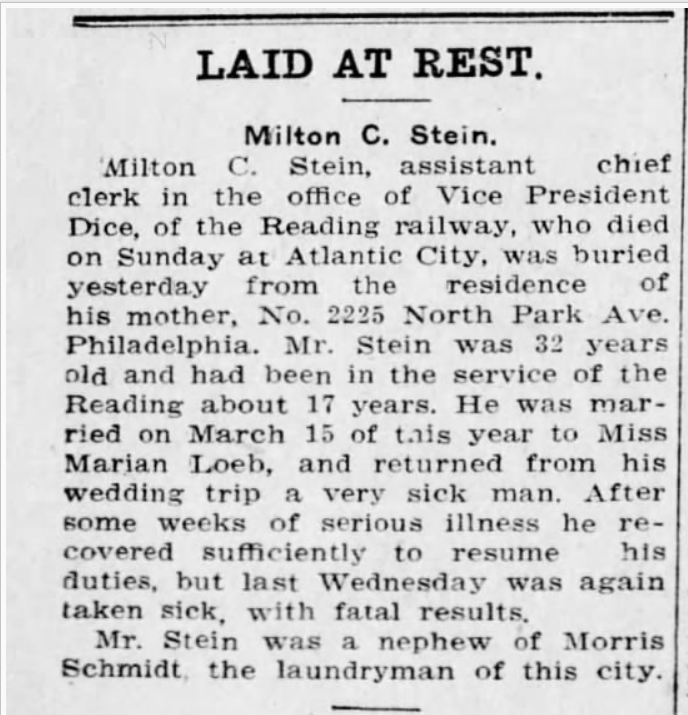 In 1940, he was living as a widower in the Albemarle Hotel in Atlantic City, and the 1941 Atlantic City directory lists Frank as a resident.9 But after that he disappeared. I couldn’t find any obituaries or death records, but what really mystified me was that there was no record of his burial with his wife Barbara and his other family members at Mt Sinai cemetery. I contacted Mt Sinai and learned that the plot that had been reserved for Frank is still unused. Barbara is buried with Frank’s sisters Celia and Rachel and one lot over from Frank’s parents. But Frank is not there. Here are two of the Mt Sinai burial records showing that Barbara and Celia are buried right near each other in lots owned by Frank. I also hired a researcher to search the New Jersey death certificates in Trenton (since they are not available online). She came up empty. So what had happened to Frank? 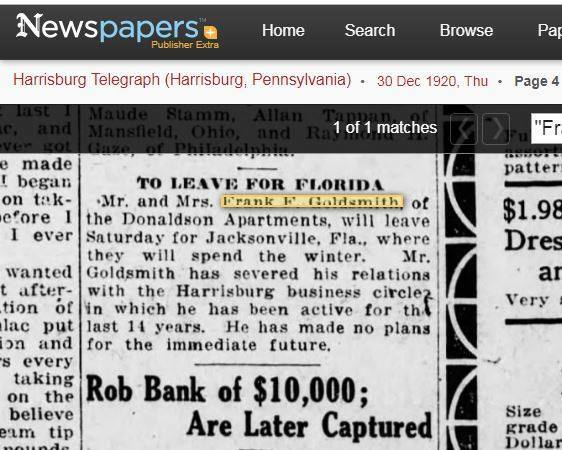 “To Leave for Florida,” Harrisburg Telegraph, December 30, 1920, p. 4. 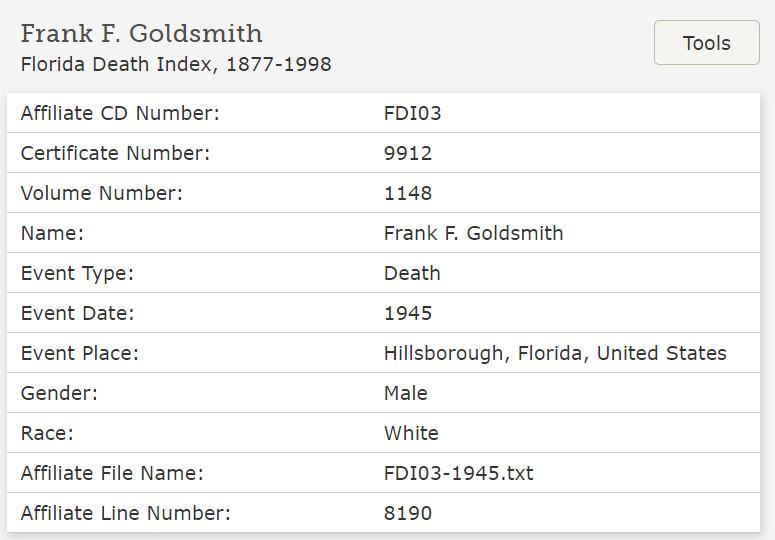 Florida Death Index, 1877-1998,” database, FamilySearch (https://familysearch.org/ark:/61903/1:1:VV91-P84 : 25 December 2014), Frank F. Goldsmith, 1945; from “Florida Death Index, 1877-1998,” index, Ancestry (www.ancestry.com : 2004); citing vol. 1148, certificate number 9912, Florida Department of Health, Office of Vital Records, Jacksonville. There was Frank F. Goldsmith, and when I saw that he was born in Pennsylvania, I was delighted, figuring that this could be my Frank. On the other hand, the census reported that this Frank was 65 years old in 1945 whereas my Frank would have been 82. 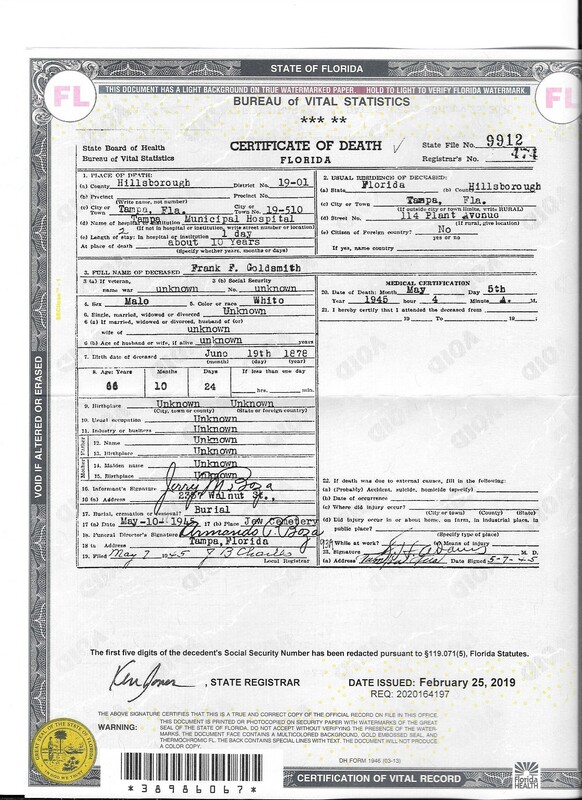 But it seemed worth ordering a copy of the death certificate from the Florida vital records office to see if it contained information that would either confirm or disprove my hope that this was my cousin Frank. 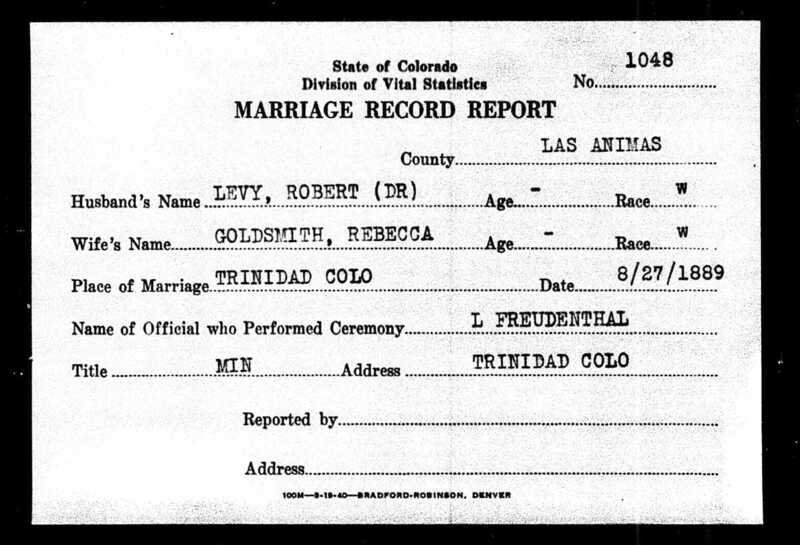 As you can see, it has no information about this Frank F. Goldsmith’s wife, parents, birth place, occupation, or much of anything that would help me tie him to my Frank F. Goldsmith. In fact, the age and birth date on the certificate are inconsistent with my Frank Goldsmith, who was born in June 1863, according to the 1900 census, not June of 1878. Despite these blanks and inconsistencies, my hunch is that this is my Frank. Why? Both Franks have a birth date in June. And on later census records, Frank’s estimated birth year based on his reported age moved later than 1863—1868 in 1910, 1876 in 1920, and 1870 in 1930 and 1940. He seemed to be getting younger as time went on. Maybe by 1945, he was giving a birth year of 1878. 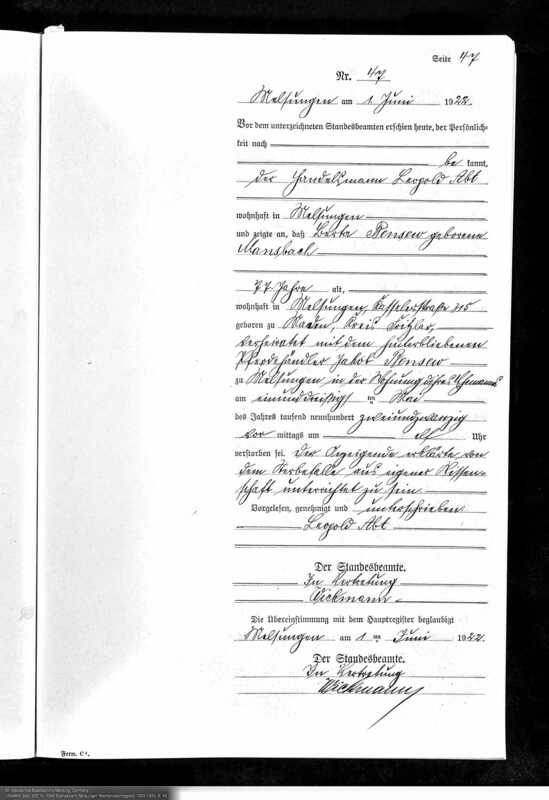 And by 1945 there was no one left to inform the hospital of his family’s names or his birth date or age so perhaps whoever completed the death certificate (looks like someone from the funeral home) was just guessing at his age and birth date. In addition, there is no other Frank F. Goldsmith who fits the parameters of the Frank on the death certificate. Finally, this Frank was to be buried in the “Jew cemetery,” so we know that he was Jewish. So what do you think? Is this enough to tie the Frank F. Goldsmith who died in Florida to my Frank F. Goldsmith? I know these are thin reeds upon which to make a case, but I think they may have to be enough. In any event, like his sisters Rachel, Celia, Annie, Emma, Eva and Florence, and his brother Felix, Frank Goldsmith has no living descendants. In fact, it is quite remarkable how few living descendants Jacob Goldsmith and Fannie Silverman have, considering that they had had fourteen children. Five of those fourteen children did not have children of their own: Emma, Rachel, Celia, Frank, and Florence. Four of Jacob and Fannie’s children had no grandchildren: Annie had three children, but none of them had children. Eva had one son, Sidney, who did not have any children, and the same was true of Gertrude’s son Bernard and Felix’s two children Ethel and Clarence. From fourteen children, Jacob and Fannie had twenty grandchildren and only twelve great-grandchildren, and a number of those great-grandchildren also did not have children. From my count, there were only ten great-great-grandchildren. With each generation, instead of growing, the family became smaller. But that is not the legacy of Jacob and Fannie Goldsmith. Rather, theirs is the remarkable story of two young German immigrants settling in western Pennsylvania and then Philadelphia, raising fourteen children who eventually spanned the continent. From all appearances, many of those fourteen children stayed close, both geographically and presumably emotionally. Many of them lived together, especially the daughters who spent years in Denver together. Like so many first-generation Americans, these fourteen children provided evidence to their parents that the risks they took leaving their home country behind and crossing the ocean were worthwhile. Yes, there was plenty of heartbreak along the way, but overall Jacob, Fannie, and their fourteen children lived comfortably and free from oppression. In the first decade after Jacob Goldsmith died in 1901, there were occasions for celebration as well as times of mourning and loss. 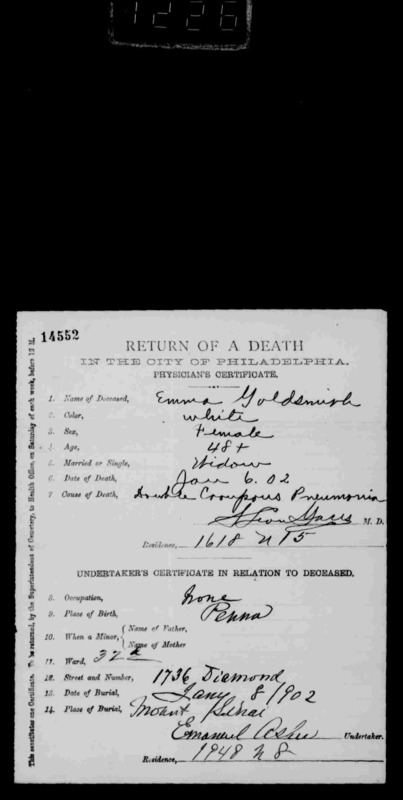 Pennsylvania, Philadelphia City Death Certificates, 1803-1915,” database with images, FamilySearch (https://familysearch.org/ark:/61903/3:1:S3HT-665P-M?cc=1320976&wc=9FR3-YWL%3A1073330701 : 16 May 2014), 004056150 > image 1230 of 1777; Philadelphia City Archives and Historical Society of Pennsylvania, Philadelphia. What about Jacob’s other ten children and their families? First, one of Jacob’s grandchildren married and had children of her own in this decade. 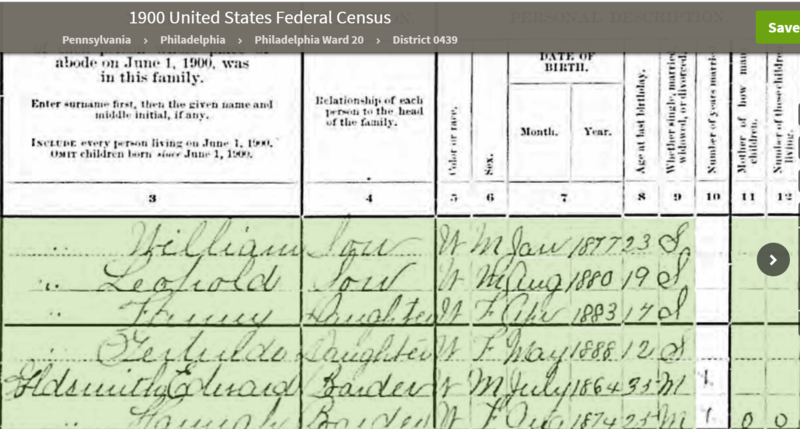 Ellena Goldsmith Feldstein’s daughter Fannie married Isadore Neufeld on September 21, 1904, in Philadelphia.2 Isadore was also a Philadelphia native, born on July 5, 1881.3 His parents Gustav Neufeld and Ida Hauff were German immigrants. 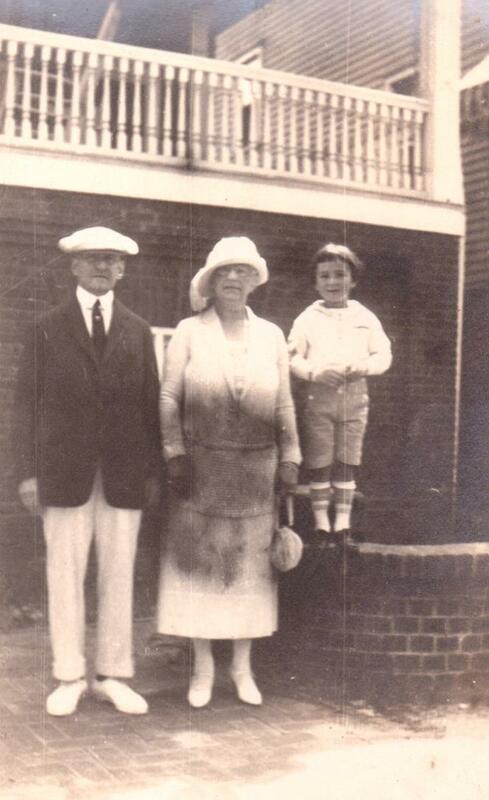 Isadore was employed as an apprentice shirt cutter and living with his parents in 1900.4 Fannie and Isadore’s first child Hortense was born on August 25, 1905.5 A second child Sylvia Wilma Neufeld was born three years later on August 7, 1908. Both were born in Philadelphia. 1908 was a very hard year for some members of the extended family of Jacob Goldsmith. 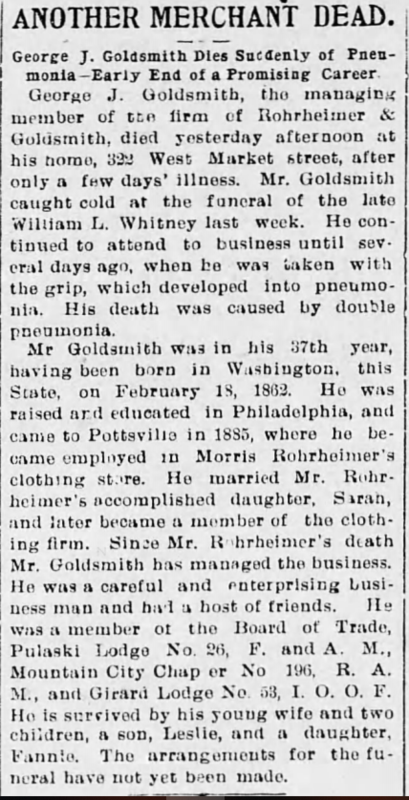 William Feldstein, the 31-year-old son of Ellena Goldsmith and Samuel Feldstein, died in Denver on February 8, 1908, from tuberculosis; his body was returned to Philadelphia for burial. 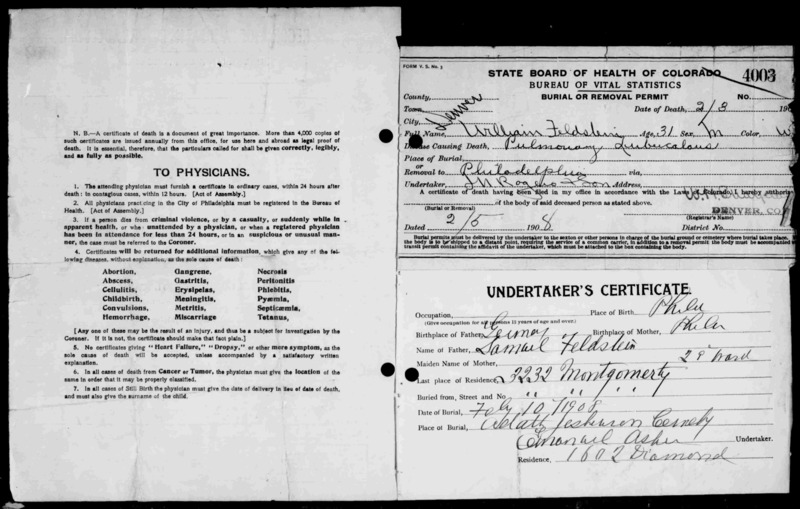 Pennsylvania, Philadelphia City Death Certificates, 1803-1915,” database with images, FamilySearch (https://familysearch.org/ark:/61903/1:1:JJ94-FFV : 8 March 2018), William Feldstein, 03 Feb 1908; citing cn 4003, Philadelphia City Archives and Historical Society of Pennsylvania, Philadelphia; FHL microfilm 1,402,930. Less than four months later, William’s father Samuel died in Philadelphia on May 29, 1908, from cerebral apoplexy, or a stroke. He was 61. Ellena had lost a son and husband in the space of just a few months. The struggles of Felix Goldsmith in this decade will be discussed in a separate post to follow. Annie Goldsmith Frank was still living in San Francisco in 1910 with her three children. Josephine continued to work as a teacher, and Harry was a traveling salesman for a liquor house. Annie’s third child, Fanny, was not employed outside the home. According to the 1910 census, Harry had married a year before. Unfortunately, I could not find any information about Harry’s wife except what was on the 1910 census: that her name was Mildred, that she was born in about 1889 in California, that her father was also born in California and her mother in New York. Since, as we will see, Harry was remarried by the next census, finding more information about Mildred was extremely difficult. Jacob’s other daughters were all living in Denver in 1910. Rebecca and her husband Robert Levy, the doctor, were providing a home not only for their two young daughters Leona and Marion but also for Rebecca’s two remaining unmarried sisters, Rachel and Celia. Gertrude and Florence, who were married to the Emanuel brothers, Jacob and Jerry, in 1906, were all living in the same household in Denver; Jacob and Jerry were clothing merchants. Thus, the extended family of Jacob Goldsmith experienced some losses in the first decade of the 20th century. It started with Jacob’s death in 1901 and his daughter Emma’s death the following year. Ellena lost a son and her husband in 1908. But on the positive side, three of Jacob’s daughters married in this decade as did two of his grandchildren, and several babies—Jacob’s grandchildren and great-grandchildren—were born. 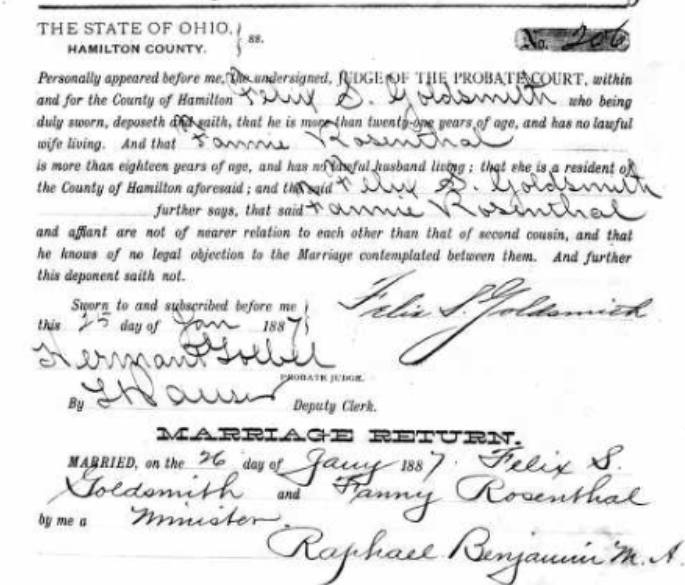 When he died in 1883, my four-times great-uncle Simon Goldsmith was survived by four children: Jacob and Henry in Connellsville, Pennsylvania, Lena in Columbus, Ohio, and Hannah in Pittsburgh. They all had children and some even had grandchildren by then. The family had gotten so large by 1883 that it is no longer feasible for me to address them all in one post so I will divide the story into separate multiple post segments for each of Simon’s children. This segment will address his son Jacob and his fourteen children and the families of those children; this post tells their story during the last twenty years of the 19th century. It made sense that Jacob would have moved to Connellsville after Fannie died for that is where his younger brother Henry was living. Jacob’s three youngest daughters, Florence, Gertrude, and Eva, were quite young when their mother died in 1881 (Florence was twelve, the twins only ten). Henry, who was more than twenty years younger than his half-brother Jacob, had a young wife and young children, and they would likely have been a source of support to Jacob and his children. 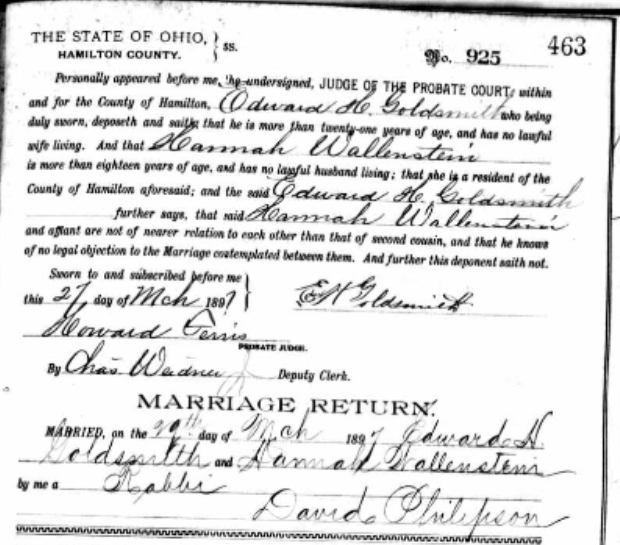 As we saw in earlier posts, three of Jacob’s daughters were already married with children of their own by the time Jacob moved to Connellsville in 1881. Ellena was married to Samuel Feldstein and was living in Philadelphia with their three young children, Sylvester, Leon, and William. Their fourth child, Fanny, was born in 1883, and a fifth child, Gertrude, was born on May 31, 1889.1 In 1881, Jacob’s daughter Annie was married to Augustus Frank and living in San Francisco with their three children, Josephine, Harry, and Fanny. Jacob’s daughter Leonora and her husband Solomon Jaffa were living in Trinidad with their daughter Helen in 1881, and their son Arthur was born in 1883. Also, Jacob’s son Felix was not married, but had moved to Santa Fe, New Mexico, in 1881. But Jacob still had ten children living with him in 1881. Jacob’s son George moved to Pottsville, Pennsylvania in 1885; he was working as a cutter.5 By 1889, he had married Sarah Rohrheimer, also a daughter of German immigrants, Morris Rohrheimer and Mary Schloss. Sarah was born on July 13, 1866, in Pennsylvania, and in 1880, she was with her parents in Pottsville where her father was a clothing merchant.6 George was working for her father when they met.7 Their first child, Fanny, was born October 1, 1889, in Pennsylvania.8 Thus, Jacob had two more grandchildren born in 1889. 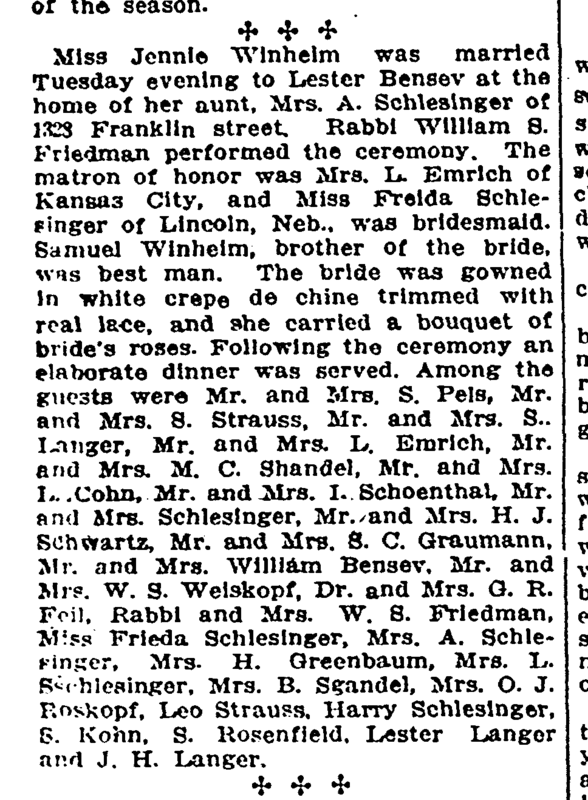 Not only were two more children born into Jacob’s extended family in 1889, there were also two more weddings. Jacob’s son Frank Goldsmith married Barbara Shanor on July 7 of that year. 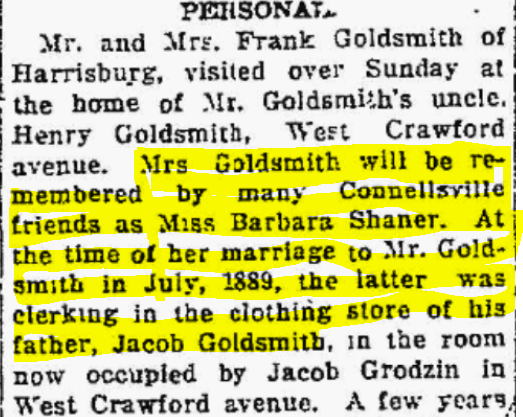 According to this news article, Barbara was a native of Connellsville and Frank was working there in his father’s store in Connellsville when they married. 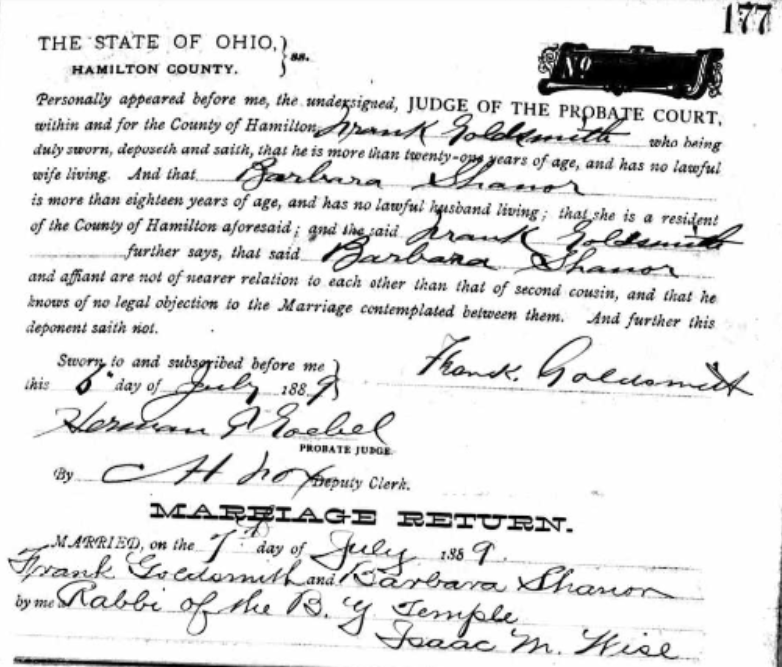 They married, however, in Hamilton County, Ohio, as had Frank’s brother George two years earlier. Eight of Jacob’s fourteen children were now on their own, but in 1890, Jacob still had six daughters at home in Connellsville: Emma, Rachel, Celia, Florence, Gertrude, and Eva, ranging in age from 36 to nineteen. 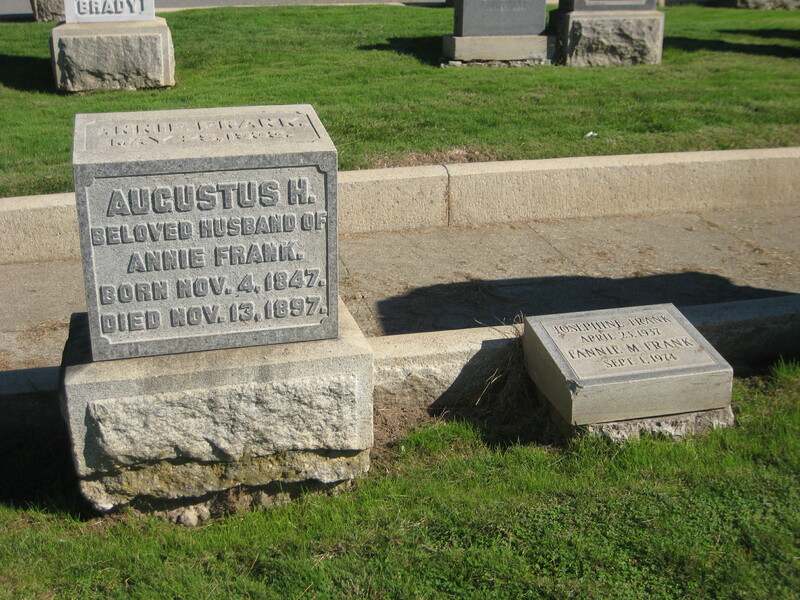 Then just a little over a year after losing Augustus, the family suffered another tragic loss when Jacob’s son George died suddenly from pneumonia on January 13, 1899, in Pottsville, Pennsylvania.17 George was only 36, and his two children Fanny and Lester (incorrectly named as Leslie in George’s obituary) were only nine and three when they lost their father. George’s widow Sarah was only 32. Felix Goldsmith and his family were also living in Denver in 1900, and Felix was working as a mine superintendent. About two hundred miles south of Denver, Leonora Goldsmith Jaffa was still living in Trinidad, Colorado with her husband Solomon Jaffa and their two children Helen (18) and Arthur (16), and Solomon continued to be a merchant. Annie Goldsmith Frank, who had been widowed three years earlier, was living with her three children in San Francisco in 1900. Her daughter Josephine, now 22, was a school teacher, and her son Harry, 19, was a shipping clerk. Back east, George Goldsmith’s widow Sarah and two children Fanny and Lester were living in Pottsville, Pennsylvania, with Sarah’s mother Mary Rohrheimer. Both Mary and Sarah listed their occupation on the 1900 census as “capitalists.” I wonder what that meant! Jacob’s other three surviving children were all in Philadelphia in 1900. Frank Goldsmith was living with his wife Barbara and working as a clerk in the clothing business.19 Edward Goldsmith and his wife Hannah were living with Edward’s older sister Ellena and her husband Samuel Feldstein and their five children. Edward had no occupation listed, but in the 1901 Philadelphia directory, he is identified as a salesman. 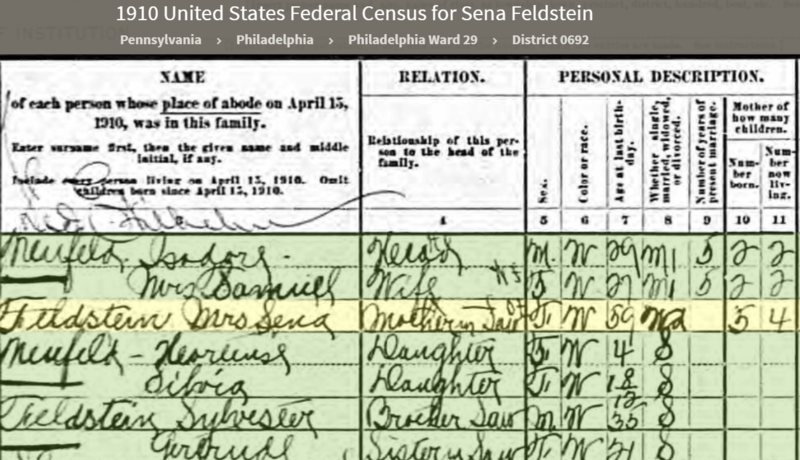 Samuel Feldstein’s occupation was reported as “manufacturer” on the 1900 census. Samuel and Ellena’s three oldest sons were working: Sylvester, 25, as an artist, William, 23, as a bookkeeper, and Leopold, 19, as a cigar maker. The other two children—Fanny, 17, and Gertrude, 12, did not have occupations listed. Thus, as of 1900, Jacob’s family was spread between Pennsylvania, Colorado, and California. What would the new century bring for him and his very large extended family? 1867 Map of the United States and territories, United States. General Land Office. As of the end of 1871, Simon Goldsmith and his four surviving children—Jacob Goldsmith, Lena Basch, Henry Goldsmith, and Hannah Benedict—were all living in Pennsylvania, Jacob and his family in Philadelphia, Lena and Hannah and their families in Pittsburgh, and Henry in Connellsville. Simon was living with Hannah in Pittsburgh as well. All four children were married, and Simon had 24 grandchildren ranging in age from newborn Jacob W. Goldsmith, Henry’s son, to eighteen-year-old Ellena Goldsmith, Jacob’s daughter. Ten years later the family was no longer all living in Pennsylvania. That movement out of Pennsylvania is best illustrated by the children of Simon’s oldest child, Jacob. Although Jacob and his wife Fannie remained in Philadelphia in the 1870s where Jacob continued to work as a clothing merchant, three of their children moved far away. 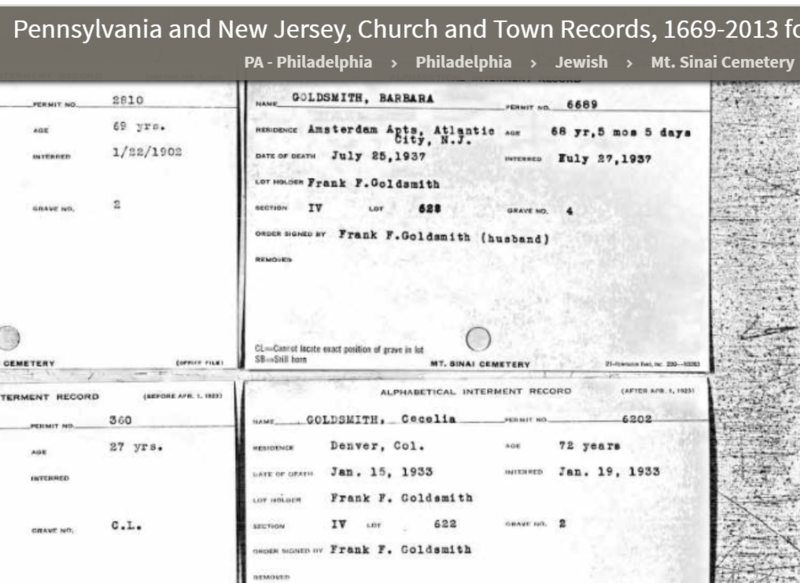 Pennsylvania, Philadelphia City Death Certificates, 1803-1915,” database with images, FamilySearch (https://familysearch.org/ark:/61903/1:1:JK32-B35 : 9 March 2018), Arthur Feldstein, 09 Jan 1874; citing , Philadelphia City Archives and Historical Society of Pennsylvania, Philadelphia; FHL microfilm 2,022,093. From this article it appears that Felix was then in Trinidad, Colorado, working for his brother-in-law’s company, Jaffa Brothers, but was moving in 1881 to Santa Fe to work for another merchant there. Thus, by 1881, four of Jacob and Fannie’s children had spread their wings and moved out of the nest. Meanwhile, back in Philadelphia, Jacob was still working as a clothing merchant and still had ten children at home plus his niece Ella Bohm, the daughter of his deceased sister Eva. Seven daughters were still home: Emma, Rachel, Celia, Rebecca, Florence, Eva, and Gertrude. None were employed, and the youngest four were still in school. Three sons were also still living at home: George, Frank, and Edward. George was working as a clerk in a clothing store and Frank as a clerk in a stationery store. Edward was still in school. On March 4, 1881, Jacob’s wife Fannie Silverman Goldsmith, who had given birth to fourteen children between 1853 and 1871, died at age 53 from tuberculosis. She was survived by her husband Jacob, her fourteen children, and numerous grandchildren, some of whom were born after she passed away. 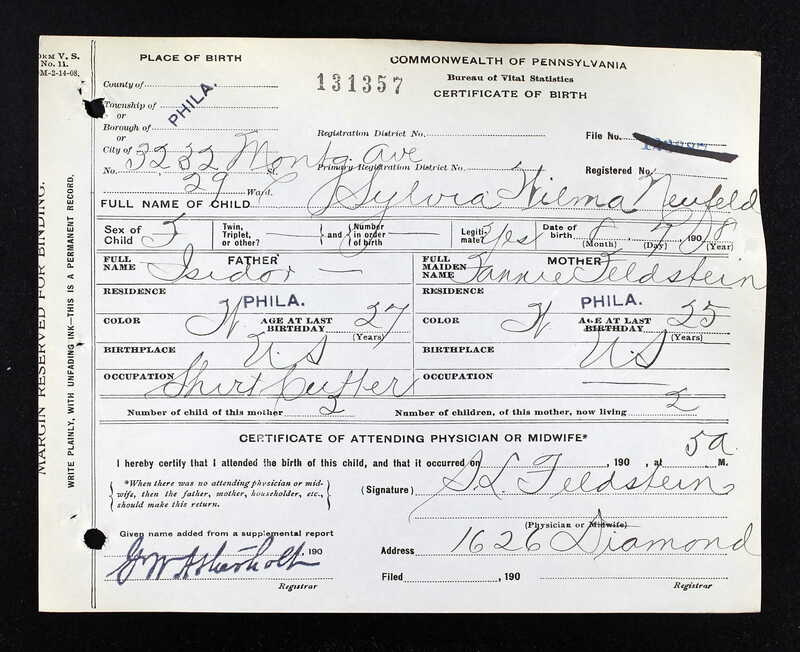 Fannie Silverman Goldsmith death certificate,”Pennsylvania, Philadelphia City Death Certificates, 1803-1915,” database with images, FamilySearch (https://familysearch.org/ark:/61903/3:1:S3HT-66Y7-VGR?cc=1320976&wc=9FRQ-ZNL%3A1073342601 : 16 May 2014), 004058654 > image 1071 of 1222; Philadelphia City Archives and Historical Society of Pennsylvania, Philadelphia. Fannie certainly deserved these honors, having given birth to and raised fourteen children. Why I Love Marriage Announcements: Guest Lists! 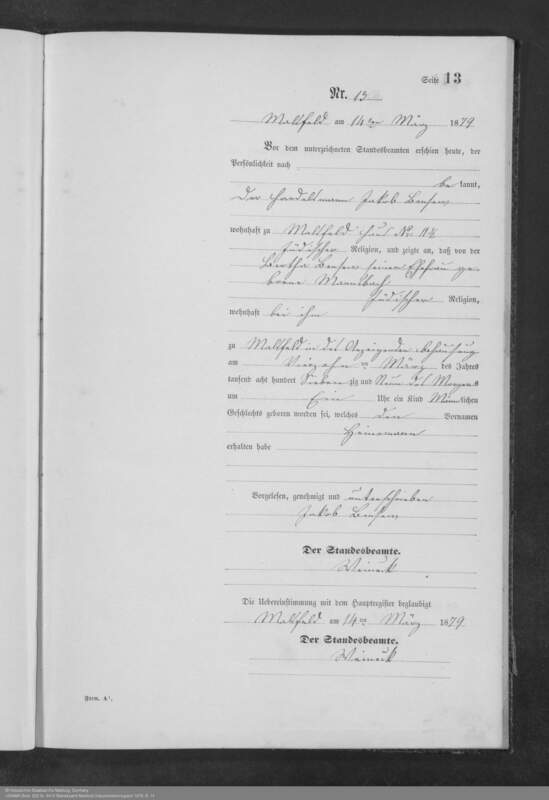 Thus, it appears to me that Jennie Winheim, who according to the 1910 census came to the US in 1895, must have been the daughter of a sister of Abraham Schlesinger. Her uncle had died a year before her wedding, but his widow hosted her wedding at their home. 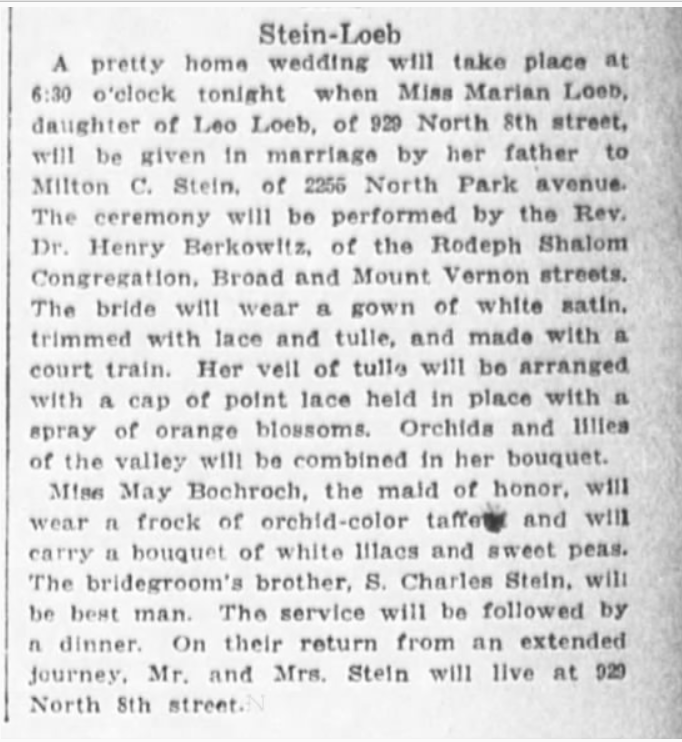 But what made this wedding article particularly exciting to me were the names on the guest list because included on that list were my great-grandparents—Mr. and Mrs. 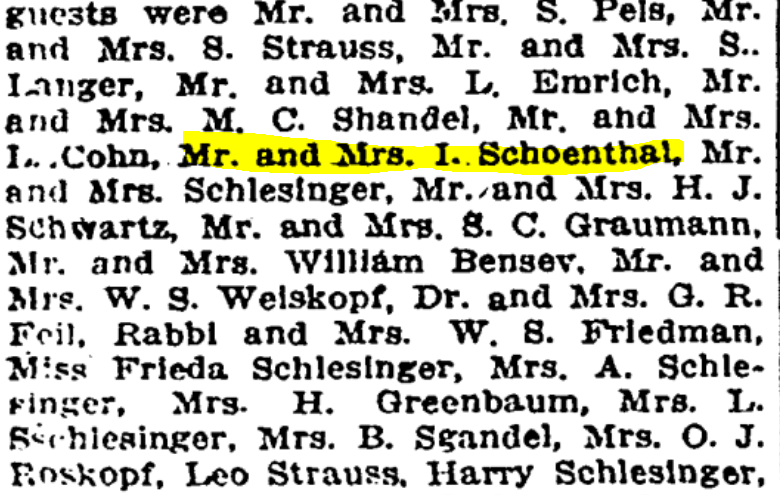 I. Schoenthal—that is, Isidore Schoenthal and Hilda Katzenstein. Why would they have been attending this wedding? Well, follow the bouncing ball. Hilda Katzenstein was the daughter of Eva Goldschmidt Katzenstein. Eva was the sister of Sarah Goldschmidt Mansbach. Sarah was the mother of Breine Mansbach Bensew. 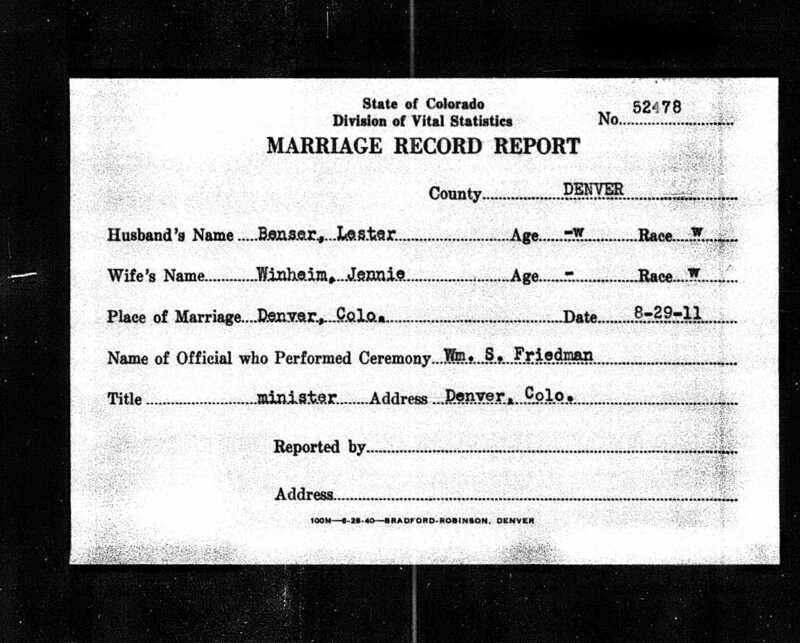 Breine was the mother of Lester Bensev, the groom who married Jennie Winheim. 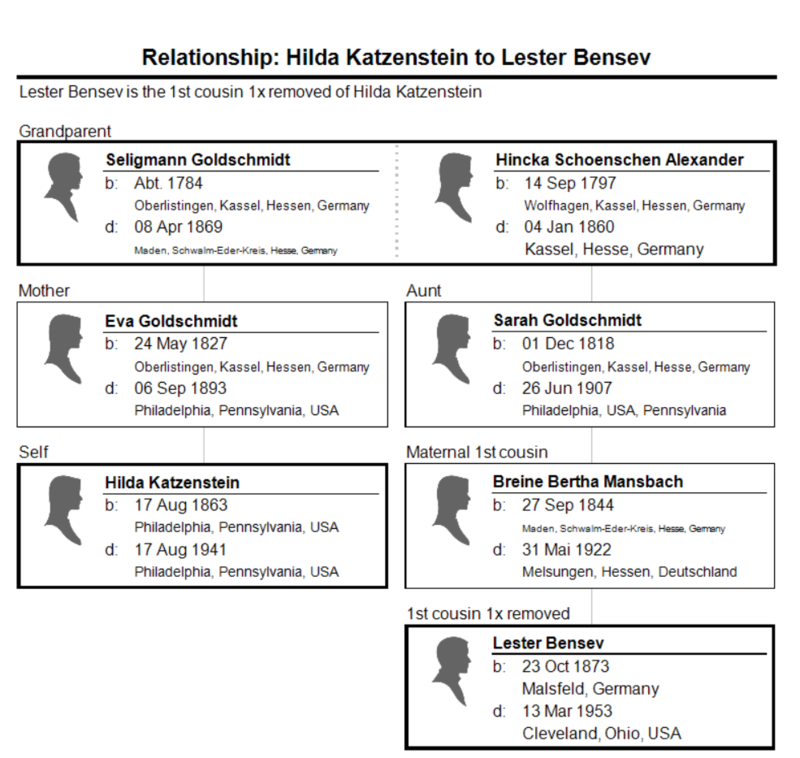 In other words, Hilda Katzenstein Schoenthal was Lester’s first cousin, once removed—his mother Breine’s first cousin. Isidore and Hilda had only recently moved to Denver in 1907 after their son Gerson was diagnosed with asthma. Imagine how happy Hilda must have been to find some cousins in Denver when she got there. When she married Isidore, she had relocated from Philadelphia where she was raised to the small town of Washington, Pennsylvania, and now she was moving 1300 miles further west. I had always thought that she and Isidore knew no one out in Denver, so I was quite excited to learn that she had family there and that she and Isidore were included in this wedding. In fact, now I know that not only did she have her cousin Lester Bensev living in Denver, her first cousin Amelia Mansbach Langer and her family were also living there. However, it’s not very likely that Hilda knew these cousins well and possible she had never met them before moving to Denver since when they immigrated and settled in Colorado, she was married and living in Washington, Pennsylvania. She grew up in Philadelphia, they grew up in Germany. But family is family, and the fact that Hilda and Isidore were invited to this wedding demonstrates that these cousins were in fact in touch when Hilda and Isidore moved to Denver. Lester died on March 13, 1953, in Cleveland, and his wife Jessie died three years later on August 16, 1956.10 He was 79 when he died, she was seventy. They were survived by their daughter Hortense and her family. 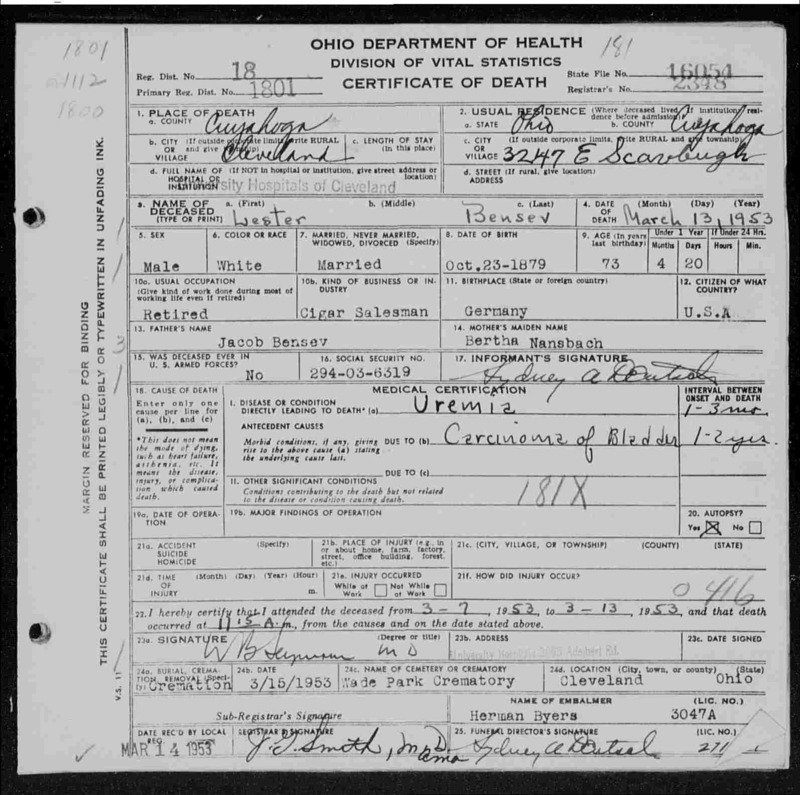 Ohio Deaths, 1908-1953,” database with images, FamilySearch (https://familysearch.org/ark:/61903/3:1:S3HY-68JS-P5T?cc=1307272&wc=MD96-BP8%3A287602201%2C293606502 : 21 May 2014), 1953 > 13601-16300 > image 2835 of 3155. But notice that here Heine is listed under the name Jack. At first I was thrown—was this yet another Bensev brother? 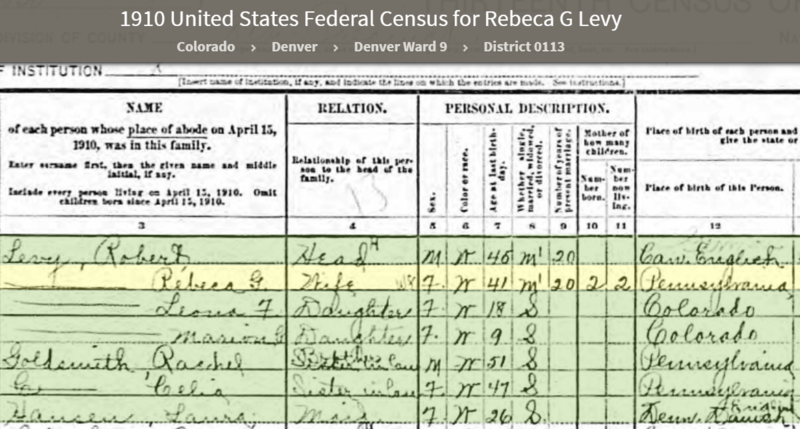 According to the 1920 census, Jack Bensev was 39 years old so born in about 1879-1880. Heinemann Bensew was born in Malsfeld, Germany on March 14, 1879. 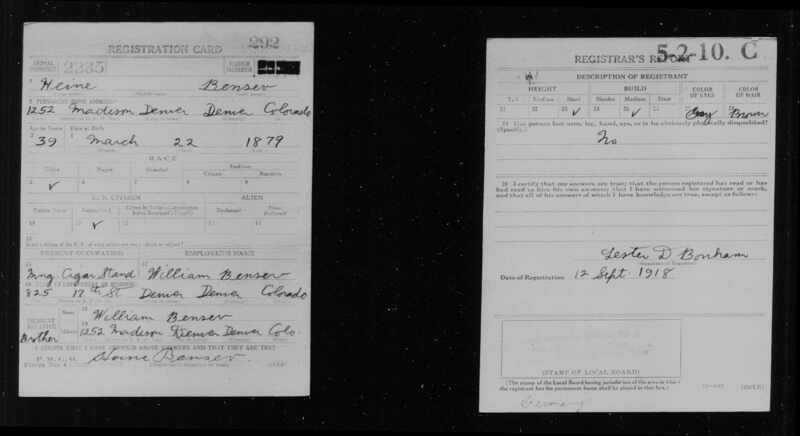 Heine Bensev, World War I draft registration, “United States World War I Draft Registration Cards, 1917-1918,” database with images, FamilySearch (https://familysearch.org/ark:/61903/3:1:33S7-817R-9STQ?cc=1968530&wc=9FHB-BZS%3A928310401%2C928571801 : 14 May 2014), Colorado > Denver City no 5; A-Talom, William M. > image 229 of 3469; citing NARA microfilm publication M1509 (Washington, D.C.: National Archives and Records Administration, n.d.). The 1920 census also reported that both William and “Jack” immigrated in 1881 and were naturalized in 1885. This is plainly wrong. 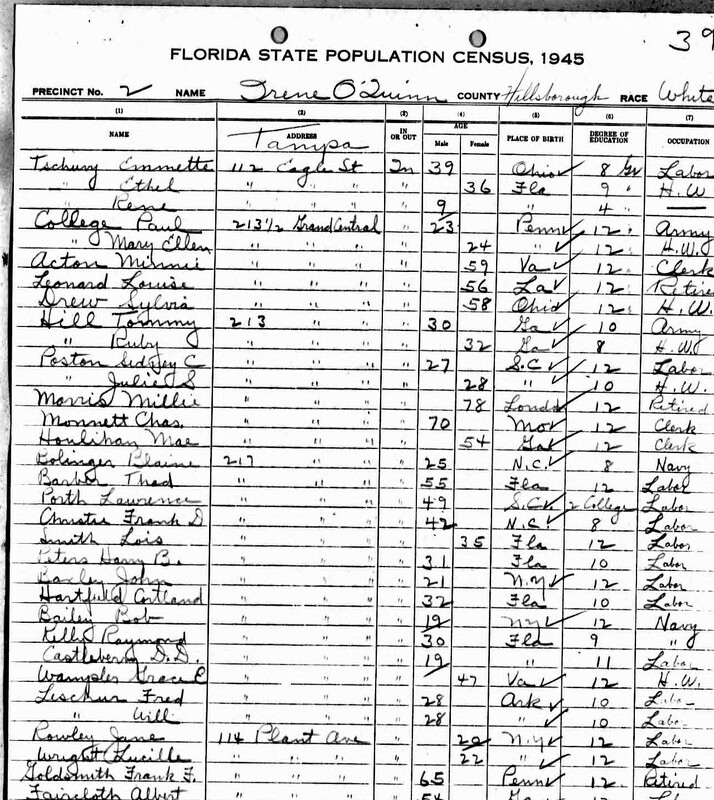 Even based on the facts in the same census, Jack would have been only toddler in 1881 and a kindergartner in 1885. In the end I concluded that Heine and Jack were in fact the same man and that the family called him Heine, but the outside world called him Jack—probably to appear more American. 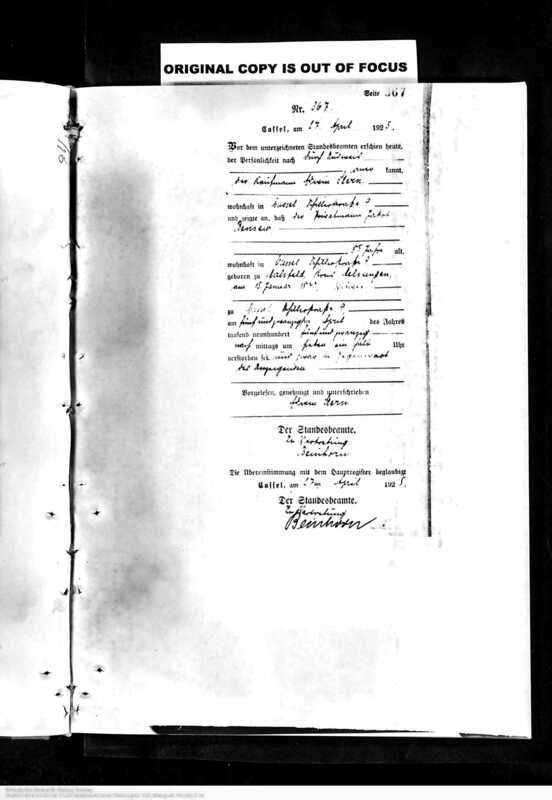 On the 1930 census, he was listed as Heine Bensev and was living with his brother William and his family. William was the proprietor of a cigar store, and Heine was a cigar salesman. 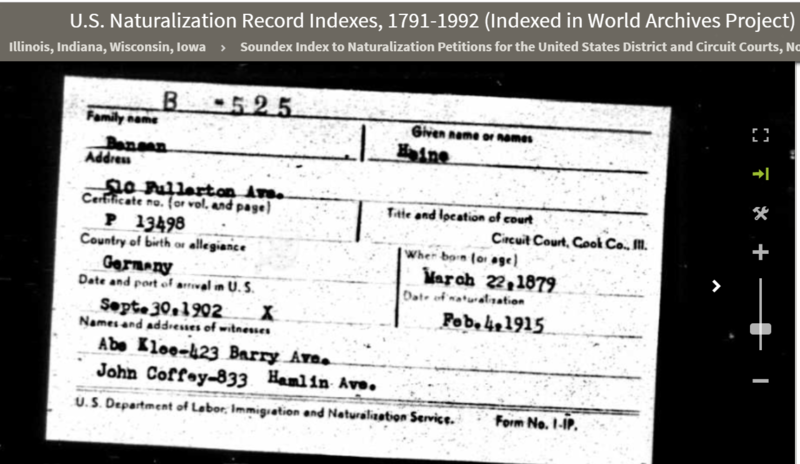 Now he listed his immigration date as 1902, which is consistent with the date on Heine’s naturalization record. 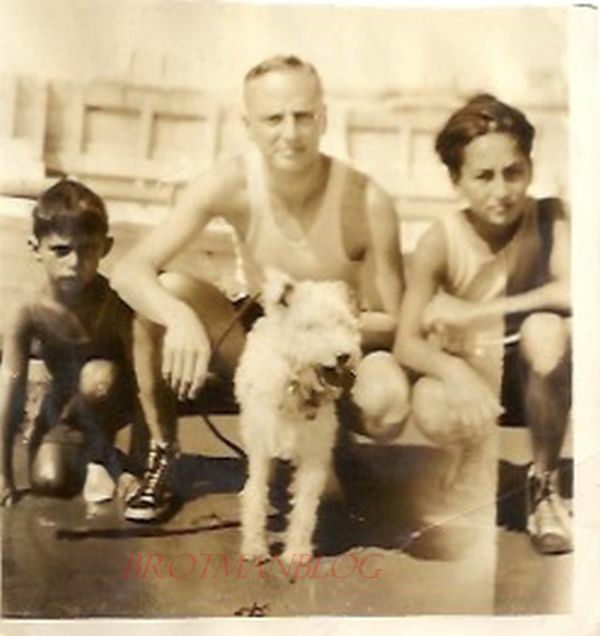 But in 1923 Max and Julius sailed together on the SS Rotterdam from Rotterdam to New York, and both gave their address as 825 17th Street in Denver. If they were living in Denver for any extended period, it is strange that Julius is not listed in the Denver directories for any year. Max does appear once, in 1933, but that is also the only year he appears in the Denver directory. However, on the 1940 census, the listing for the William Bensev household in Denver included William Bensev, his wife Jessie, daughter Theodora, nephew Edwin Stern, brother Heine and his brothers Julius and Max. Julius and Max are listed on a separate page in the census report , but at the same address and clearly in the same household. Julius and Max were now working as traveling salesman selling wholesale luggage. Heine and William were both still working in the cigar business. Thus, William had three of his brothers living in his household as well as a nephew, Edwin Stern, son of his sister Roschen, plus, of course, his wife Jessie and daughter Theodora. And a maid. The younger Bensev siblings lost three family members in the next few years, first their oldest brother William, who had provided a home for so many of them. William died on January 13, 1944, at age 68.15 William’s wife Jessie died less than a year later on September 13, 1944, when she was 60.16 And then sadly William and Jessie’s daughter Theodora died October 5, 1946 when she was only forty.17 Theodora had not married or had children, so there are no descendants for William and Jessie Bensev or their daughter Theodora. Ancestry.com. 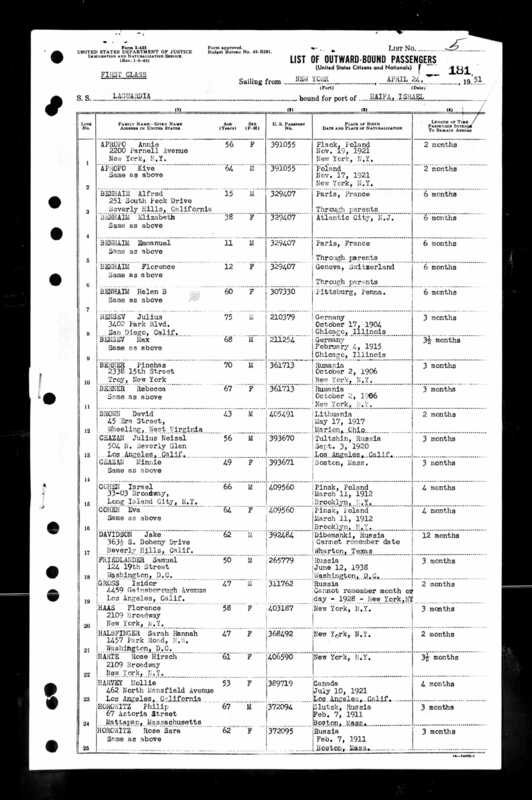 U.S., Departing Passenger and Crew Lists, 1914-1966 , lines 7 and 8. 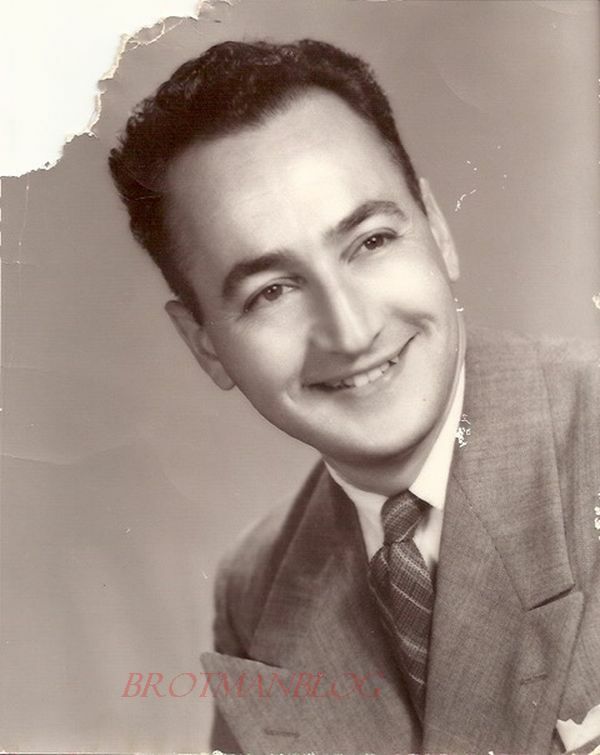 I cannot find a death record for Julius Bensev, but I believe he died sometime between September 1954 and April 1956 because (1) only Max is listed in the 1956 San Diego directory and (2) Max traveled alone on April 25, 1956, for a five to six month visit to Germany.22 Max died on November 14, 1959, in San Diego.23 He was 77 years old. Julius must have predeceased him because Max’s death notice named only his sister Frieda and cousin Alfred as survivors. Julius must have died outside California as, unlike Max and Heine, he is not listed in the California Death Index. Julius, Heine, and Max never married or had children, and thus, like their brother William, they have no living descendants. Of the five Bensev brothers, only Lester has living descendants. What about the two sisters, Frieda Bensew Loewenherz and Roschen Bensew Stern? What happened to them in the 20th century? Stay tuned for the next post. As seen in the last two posts, the years between 1910 and 1920 were primarily years of growth for the children of Sarah Goldschmidt and Abraham Mansbach. Unfortunately the next decade was not as happy a time; the family suffered a number of losses as the children of Sarah and Abraham entered their sixties and seventies. 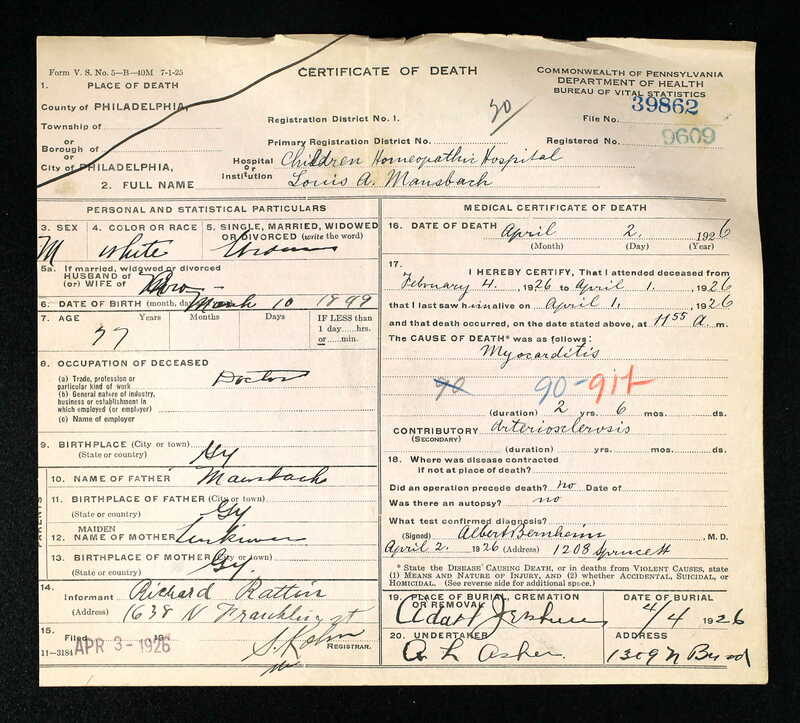 A couple of observations about this death certificate. One, Louis was a veterinarian, but the certificate says he was a doctor; while a vet is a doctor in one sense of the word, it’s still odd that he is identified this way and not as a veterinarian. Secondly, the informant was Richard Rattin, and I have no idea who that was. 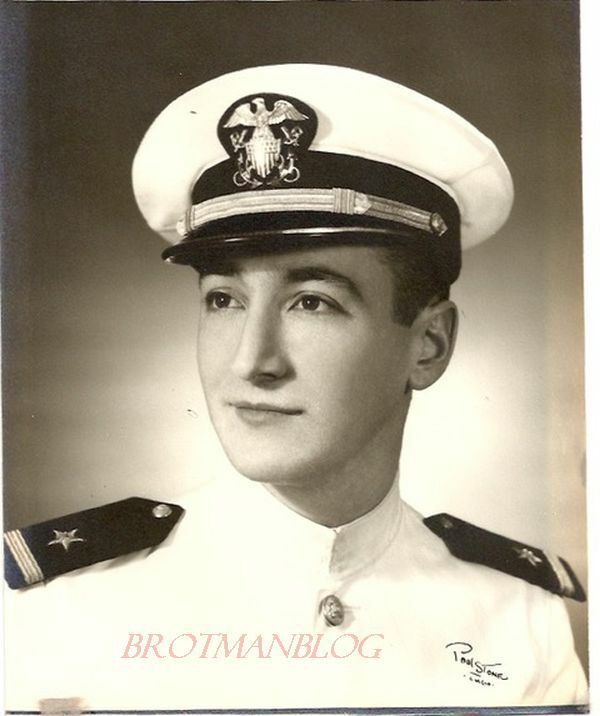 Louis’s son-in-law was David Rattin, husband of Rebecca Mansbach. He lived at 1638 North Franklin Street in Philadelphia. But as far as I can tell, David had no siblings, and his father had died long ago. I cannot find any Richard Rattin during this period or any other time in Philadelphia (or elsewhere). Could David have signed using the wrong first name? Did someone forge his signature with the wrong first name? And if so, why? Third, I was struck by the fact that the informant did not know the names of Louis Mansbach’s parents. I see this so often, and it makes me sad that so quickly the names were forgotten, but it also makes me feel good to know that I am filling in that gap for descendants who might otherwise never know who their ancestors were. 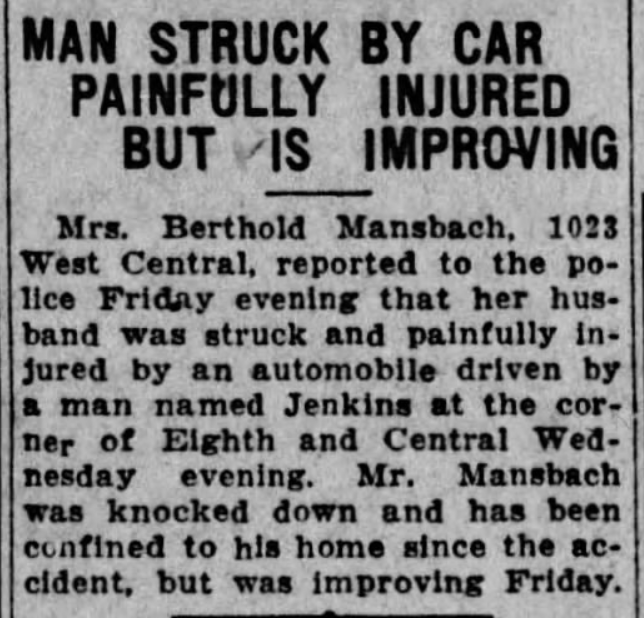 But more tragically than Louis Mansbach’s own death was the death of his daughter, Rebecca Mansbach Rattin. She died less than a month later on April 30, 1926, from meningitis; she was not yet 29 years old. She left behind her husband David and two young daughters, Ruth, who was only seven, and Virginia, who was born on June 27, 1923 and two months shy of her third birthday when she lost her mother. Thus, just as Rebecca had lost her mother Cora when she was a young girl, Rebecca’s daughters lost their mother when they were young girls. David Rattin was the informant on his wife’s death certificate. 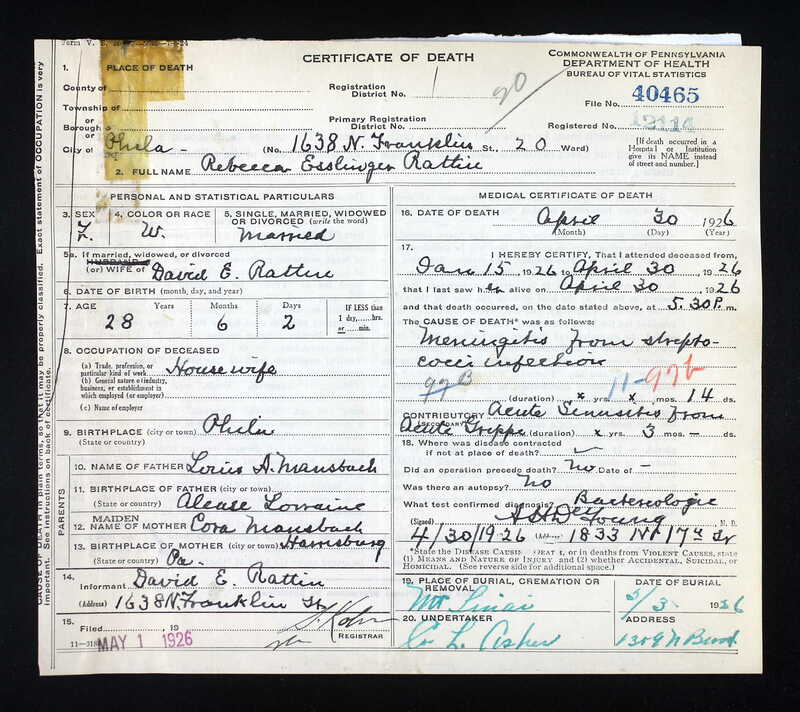 Comparing this death certificate with that for Louis above, it does not appear to be the same handwriting or signature, does it? (Also, it says that Rebecca’s father was born in Alsace Lorraine, which is not correct; he was born in Maden in the state of Hesse.) So who was Richard Rattin? Did someone else fill in the death certificate for Louis and just sign the wrong name? It appears that Rebecca had been ill since January, her father since February, so perhaps David Rattin was just too overwhelmed when Louis died to deal with the details of the death certificate. UPDATE: Frank, a member of Tracing the Tribe, commented that it was likely that David Rattin/Richard Rattin did not sign either certificate, and when I compared the signature on David’s draft registration with the two death certificates, I realized that Frank was right: David had not signed or filled out either form. The registrar or some third party did in each case. And it seems likely that in the case of Louis Mansbach’s death certificate, whoever did fill it out just got David’s first name wrong on the line identifying the informant. 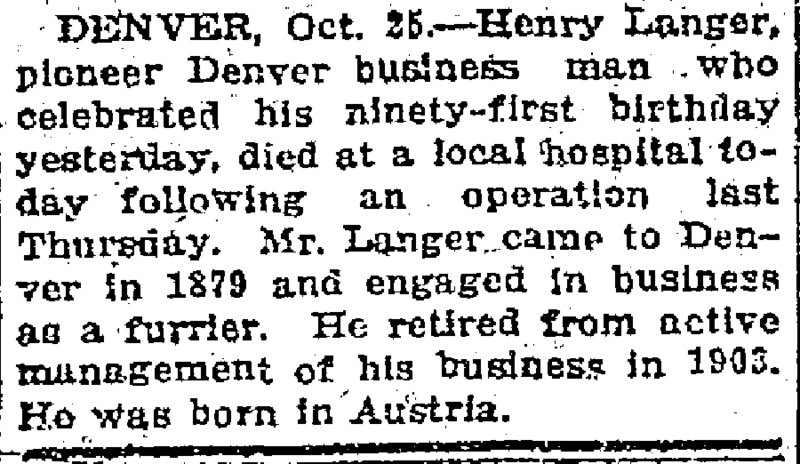 Then the third family death came when Amelia Mansbach Langer died two months after her brother Louis and niece Rebecca; she died in Denver on July 18, 1926, at age 72.1 She had been predeceased by her husband Henry Langer, who had died on October 25, 1921.2 Henry had died the day after his 91st birthday in Denver, where he had lived since at least 1880. 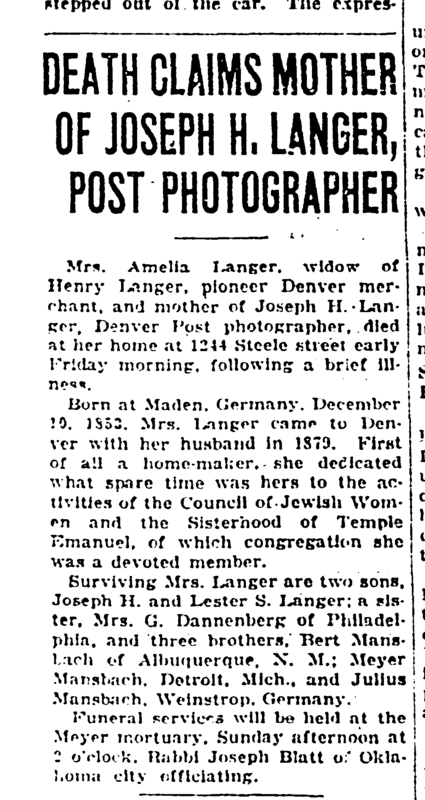 Amelia and Henry’s son Joseph remained in Denver as a photographer for the Denver Post, but by 1930 their younger son Lester had moved to Kansas City, where he continued to work as photographer. 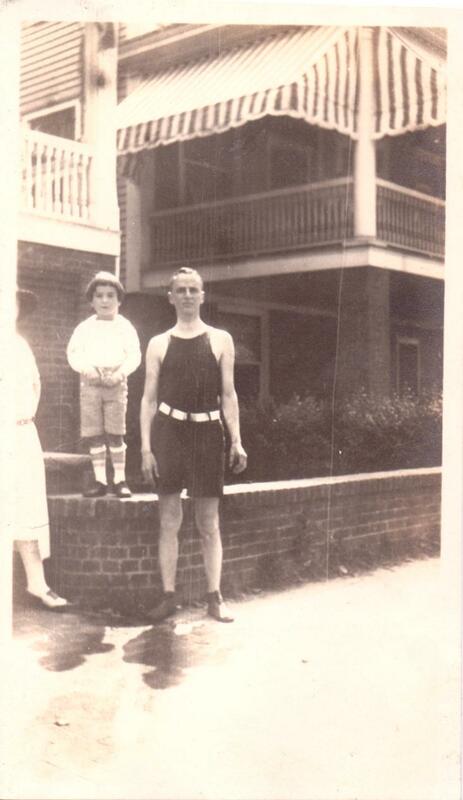 He was living in a large boarding house as a lodger in 1930.3 More on the Langer brothers in my next post. Meanwhile, back in Melsungen, Germany, Breine Mansbach Bensew, the oldest child of Sarah Goldschmidt and Abraham Mansbach, died on May 31, 1922, at age 77. Her husband Jakob Bensew died three years later on April 25, 1925, in Kassel, Germany; he was 85. Thus, by 1926, the only children of Sarah Goldschmidt and Abraham Mansbach still living were Bert, Hannah, Meyer, and Julius. For them and their children, there were some happier events in the 1920s. Bert Mansbach’s son Alvin moved to Chicago in 1921 to go to the Western Electric School. But she and Arthur Dannenberg had a long marriage together and had two children born in the 1920s, so I hope she did find happiness after experiencing the tragic loss of her new husband in 1915. 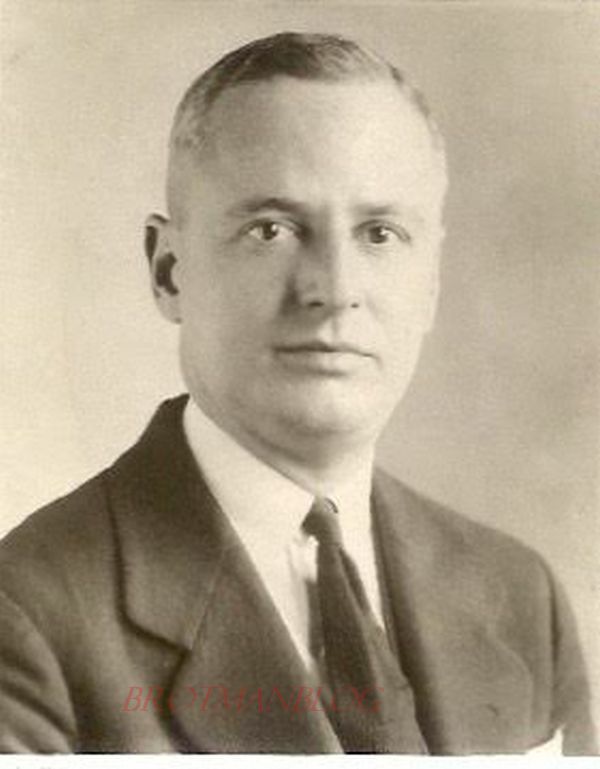 Finally, Julius Mansbach and his wife Frieda and son Alfred were still living in Germany in the 1920s, but according to Alfred’s son Art, Alfred came to the United States in 192919 to go to college in Chicago. In 1930 Alfred was living with Emanuel Loewenherz and his wife Frieda and son Walter in New Trier, Illinois, a suburb of Chicago. Alfred was listed as the cousin of the wife of the head of the household, that is, Emanuel’s wife Frieda. 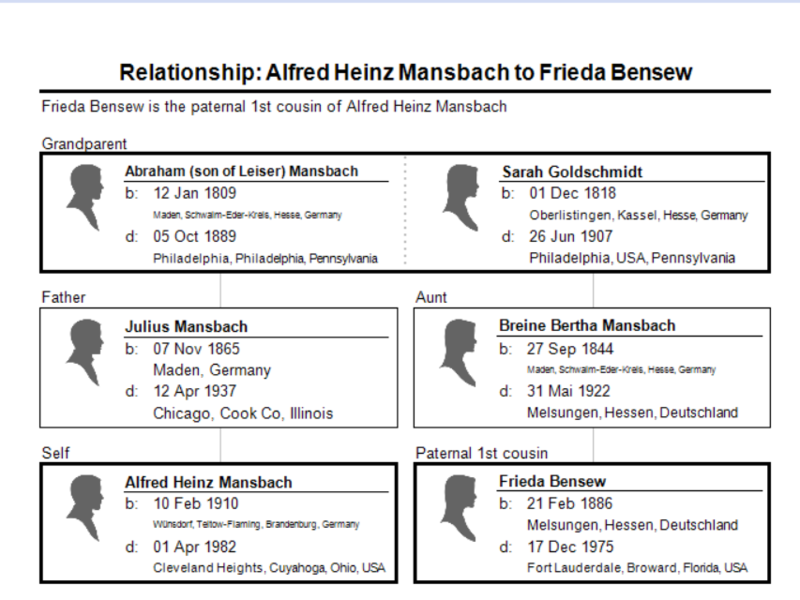 But I believe that Alfred may also have been Frieda Bensew Loewenherz’s cousin through his mother as well. Alfred’s mother was also born with the name Frieda Bensew. Although I haven’t been able to figure out the connection, my hunch is that the two Frieda Bensews were somehow related. More on the Bensew cousins in posts to come. Thus, the 1920s were years of transition for the children of Sarah Goldschmidt and Abraham Mansbach. Three of them died in this decade, and their children were adults marrying and raising their own children, the great-grandchildren of Sarah and Abraham. 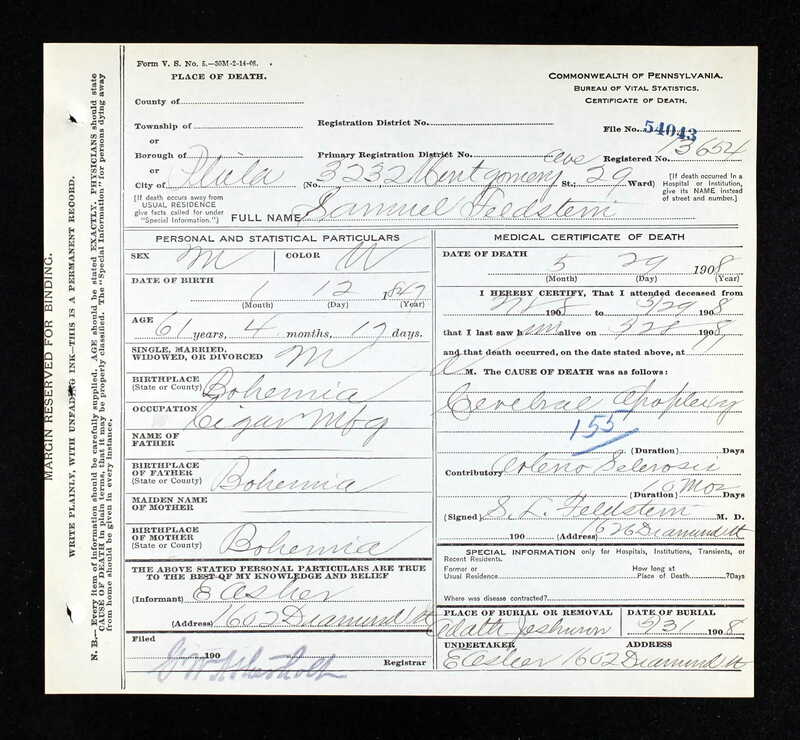 Herbert Marshutz World War I draft registration, Registration State: California; Registration County: Los Angeles; Roll: 1530901; Draft Board: 2. Finding Buddy and Junior and a New Second Cousin! I’ve been on a long break from blogging since July 13, and it was wonderful to be with the extended family on our long-loved beach. And although I was not doing much research during this time, a family research discovery fell in my lap. I made an amazing connection with a second cousin—yes, a SECOND cousin! Someone I had never known about and not found despite years of research. Doesn’t my dad resemble that little boy? The little boy appeared in this photograph as well. 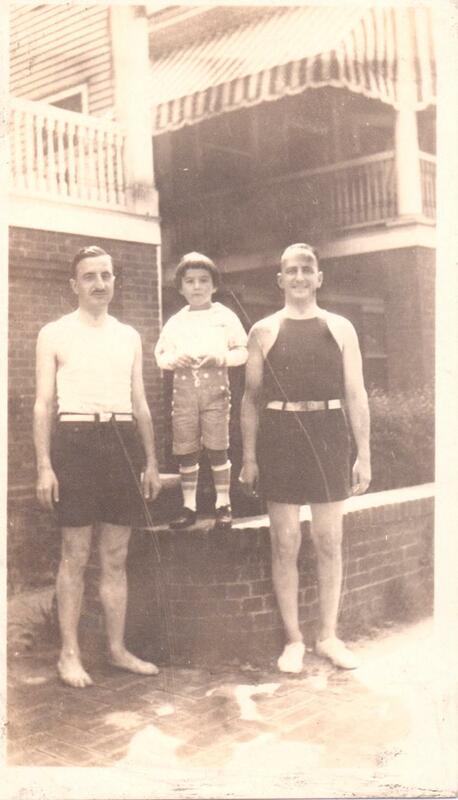 I thought the man on the right was Stanley Cohen, my father’s uncle, my grandfather’s brother. But who was the man on the left? And who was the little boy? 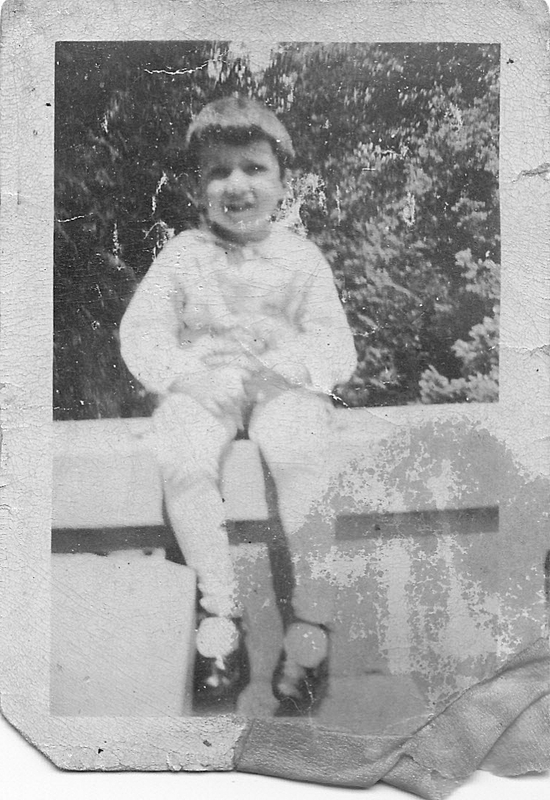 And here he is again—same little boy with a man I believed might have been my grandfather or my great-uncle Maurice, but I was not sure. So who was the little boy? The question had been left unanswered for three and a half years. Until last week. My new cousin responded all these years later by telling me that the little boy was in fact her father—Maurice L. Cohen, Junior. Maurice, who my father knew as Junior, was my father’s first cousin. He was born in 1917, making him nine years older than my father. Junior had a younger brother Buddy, born in 1922. They had both gone to camp with my father when he was a boy growing up in Philadelphia. Junior and Buddy and their mother moved to California in around 1938 after their father Maurice L. Cohen Sr.’s death in 1931. My father never saw or heard from his cousins again. 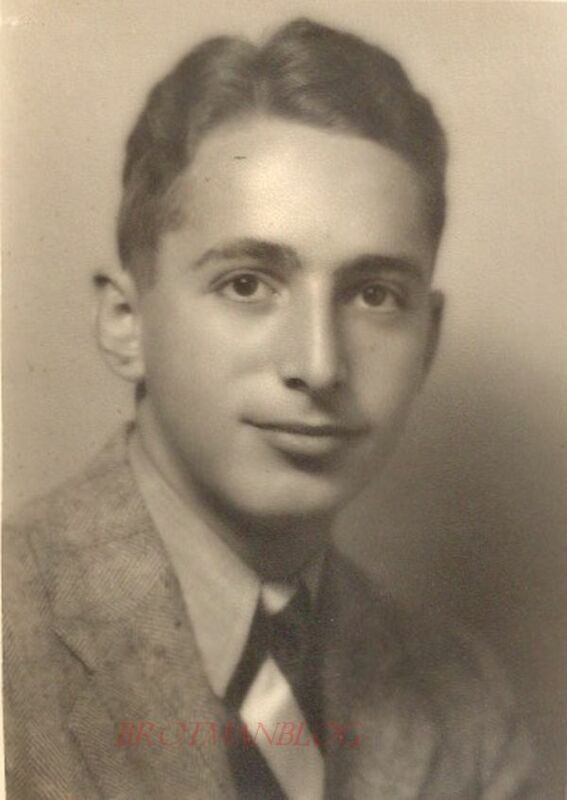 In researching my Cohen family, I had not found anything more about Maurice, Jr., and my father thought he’d never married or had children. Well, it turned out that “Junior” had married and had a daughter, Marcy, who is my second cousin. And Marcy generously shared with me photographs and stories about her father, her uncle Bud, and even a photograph of her grandfather, who died long before she was born. For one thing, I learned what drew the family to California. Junior had been attending the Wharton School at the University of Pennsylvania when he received a full scholarship to attend the College of the Pacific in Stockton, California. He decided to take advantage of the scholarship and moved to California to finish his education. His mother Edna and younger brother Bud followed him to the West Coast (Bud was still in high school at the time), and none of them ever returned to live in Philadelphia again. Edna and Bud settled in Beverly Hills, and Bud eventually attended UCLA and later married. He and his wife Helga lived in Santa Monica and did not have children. While at the College of the Pacific, Maurice, Jr., met his wife, Laverne “Nicky” Nicolas, who was from San Francisco. After completing college, Maurice served in World War II and then returned to California where he and Nicky settled in Sacramento. Their first child, Ronald Maurice Cohen, was born on June 2, 1943, and died just two and half months later on August 14, 1943. Marcy was born several years later. Maurice, Jr., was a budget analyst for the State of California until his retirement at age 65; he is reputed to have known more about California finances than anyone. He died on March 30, 1988, and his wife Nicky died five years later on May 1, 1993. Here are some of the wonderful photographs that Marcy shared with me, bringing to life my father’s first cousins and their father Maurice, Sr., my great-uncle. Fortunately my father was with me when I received these photographs last week, and I had the great pleasure of sharing them with him and seeing his face light up with recognition when he saw the faces of Junior and Buddy, faces he had not seen in over 80 years. My great-uncle Maurice Cohen, Sr. 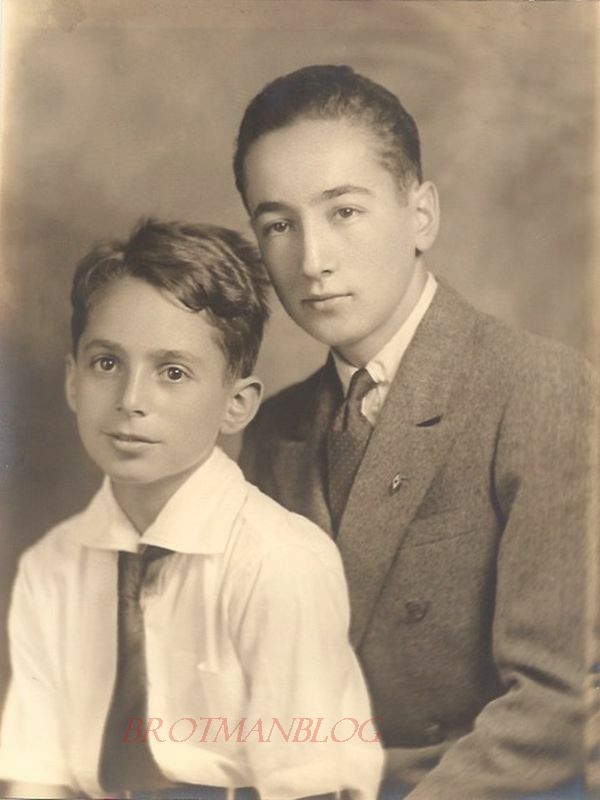 Buddy and Junior Cohen, c. 1932, my first cousins, once removed. Now that I know what Maurice, Sr., looked like, it’s clear to me that he is the man in the third photo above, standing with his son and namesake, Maurice, Jr. I often express envy of those who have so many photographs of their ancestors and other relatives. And those people often tell me not to give up hope. This experience renewed my hope. And I cannot tell you how happy I am to have connected with a second cousin after all these years. Thank you, Marcy, for finding me and for telling me who that little boy was! © Amy B. Cohen, 2013-2018. Unauthorized use and/or duplication of this material without express and written permission from this blog’s author and/or owner is strictly prohibited. Excerpts and links may be used, provided that full and clear credit is given to Amy B. Cohen and Brotmanblog with appropriate and specific direction to the original content.